The future of our profession lies in the education we provide today. ATA has partnered with The Globalization and Localization Association (GALA) to develop an online international database of education and training programs. The Directory will be an invaluable resource to students searching for programs in translation, CAT tools, interpreting, localization, project management, computational linguistics, and more. List your program! Education and training institutions are invited to submit a free profile for the Directory. You do not need to be a GALA or ATA member. ATA will actively promote the Directory to language education and industry groups, such as the Modern Language Association, American Council on the Teaching of Foreign Languages, and the Joint National Committee for Languages–creating opportunities for institutions to network and partner on specialized programs. You are invited to submit a free Directory profile for your institution’s education and training program. Your institution does not need to be an ATA or GALA member to be listed. As you create a profile for your school, you will be able to highlight particular areas of training and study. You can also include whether your program has students who are interested in internships. ATA Institutional Members will be tagged and automatically sorted to the top of Directory search results! Your listing in the Directory has the potential to reach thousands of prospective students. Plus the Directory will also be useful to institutions and industry players who want to network or partner on specialized programs. List your school, add your support! 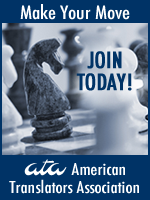 Please join ATA in its goal to support T&I education! Take a few minutes to check out the Education and Training Directory and create your program’s profile. Have questions? Contact content@gala-global.org for answers!